Golf courses offer incredible outdoor wedding photo opportunities, with their sprawling greens and impeccable landscaping. This couple was photographed on the grounds of Copper Creek Golf Club in Kleinberg, Ontario. 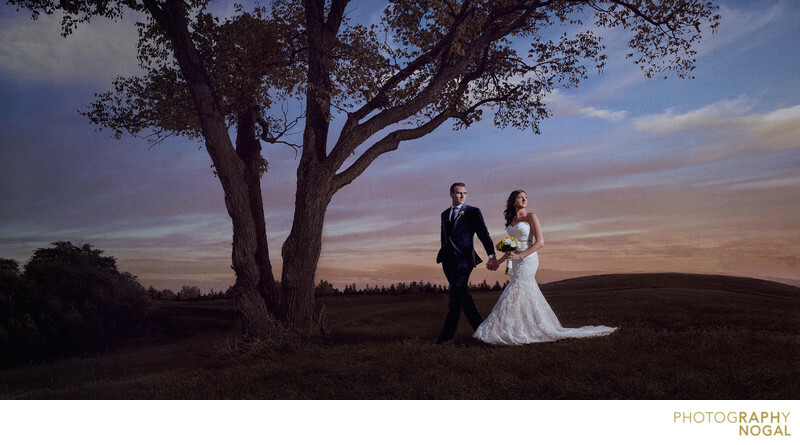 The bride and groom are set against a colourful sunset, next to one of the lush trees on the property. The black of the tree compared to the stark white of the bride’s dress, helps to draw the eye across the photo. The lighting was a Profoto B1 OCF flash held by Oliver. A Magnum Reflector was mounted on the B1 to give a bit of a hard light effect, which you will find outdoors as you mimic the sun. This photography won a Silver Award at Wedding and Portrait Photographer's International (WPPI) in the Wedding Contemporary category. Location: 11191 Hwy 27, Kleinburg, ON L0J 1C0.